Health Costs > How Much Does Varicose Vein Removal Cost? How Much Does Varicose Vein Removal Cost? Varicose veins, also known as spider veins, are the veins that bulge out of your skin, becoming enlarged when they fail to circulate blood properly. These veins will appear swollen, raised, twisty and can be very dark blue in color. 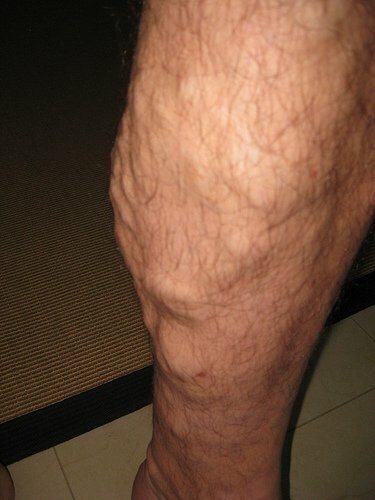 An estimated 30 million Americans, ages 18 to 70, suffer from varicose veins. These veins, unfortunately, have become quite a nuisance for those who want to have perfect legs. Luckily, there are treatments that can be done to get rid of them for good. Most treatments can be done as an outpatient procedure, and on average, the cost of the treatment is going to cost anywhere from $550 to $3,500 per leg, depending on the number of veins, the type of treatment you choose and where you live. At a minimum, the average we mention should include the doctor’s fee, treatment and aftercare supplies such as compression stockings. Vein stripping, an invasive procedure that often requires general anesthesia, could cost $1,500 to $3,500 per leg. These fees, according to Your Plastic Surgery Guide, won’t include the hospitalization fees. Another treatment such as ambulatory phlebectomy can cost $1,000 to $3,000 per leg. Endovenous laser or radiofrequency ablation, which uses a laser to get rid of the vein without removing it, can cost anywhere from $3,000 to $7,500 to complete the entire job. This procedure will depend on your location and how much of the vein/s need to be treated. This price could be higher if the job is extensive and requires more than one laser treatment. If you’re having surgery where you have to be placed under anesthesia, then you may be billed separately for the anesthesiologist, hospital stay, various medical tests and prescription medicine. Sclerotherapy injections, depending on the extent of the damage, can cost anywhere from $500 to $750. Varithena by BTG, which was approved by the FDA in 2013, will use a foam instead of a liquid, can cost $1,500 to $3,5000, again, depending on the number of veins that need to be treated. Members on RealSelf.com reported they spent an average of $950 for the procedure and close to 85 percent were happy with the results. Vein Clinics of America, a popular clinic located across the United States, uses either sclerotherapy or laser therapy. According to some published reports online, people who have gone here paid about $2,300 for the entire treatment or close to $450 per session. However, before choosing, read the many Vein Clinics of America reviews as many aren’t that positive. USA Vein Clinics, another popular clinic located across the United States, can cost about $250 per sclerotherapy injection. There are four popular ways to remove varicose veins: via vein stripping, ambulatory phlebectomy, laser therapy or sclerotherapy. These treatments will be based on your physicians’ diagnosis, the size of your veins, your medical history, age, history of allergies and how you may tolerate surgery. Vein stripping will be performed in a hospital/surgery center and can take up to 90 minutes to perform. During this surgery, the surgeon will tie and/or remove the large vein in the leg and will be recommended for those who suffer from extreme veins. During an ambulatory phlebectomy, the surgeon will create tiny cuts in the skin to remove the affected varicose veins, usually the ones closest to the surface. This will be an in-office procedure and will less invasive when compared to vein stripping. The endovenous laser ablation procedure uses a laser to heat the problem vein with high-frequency radio wave energy. During the procedure, a doctor will watch the veins as he or she performs the procedure using a duplex ultrasound screen. These veins won’t be removed and minimal bleeding will be involved since no cutting is required. With very little downtime and local anesthesia, it can produce great cosmetic results. According to WebMD.com, it closes veins about 94 out of 100 times. Sclerotherapy will involve injecting a liquid or foam-based solution into the varicose vein, which will then irritate the lining of the blood vessel, eventually causing it to destruct. Eventually, the vessel will turn into scar tissue and will fade away. With this procedure, however, everyone won’t be a candidate as it isn’t recommended for those with “great” veins. Before the surgery, as stated above, the doctor will more than likely run an ultrasound imaging assessment. This assessment, along with the medical examination, can cost an additional $250 to $500, depending on the doctor and how in depth they have to be. As stated above, you may be billed separately for the anesthesiologist, hospital stay, various medical tests and prescription medicine. The average anesthesiologist will charge about $1,000, while the average hospital stay, depending on your geographical location, could be as much as $1,500 per night without insurance. Various medical tests, such as an ultrasound to look at your circulation, may be required. All treatment options will require compression stockings after the surgery is complete. These stocks will help aid recovery and prevent any deep vein thmrombosis complications. Some doctors may include it in the initial quote, while others won’t. If they don’t, the costs for stockings can range anywhere from $150 to $250 per leg. Laser surgery is ideal for those who want to have smaller veins removed. During this treatment, a laser is going to be applied to the skin over the vein area, and the energy produced by the laser will cause the veins to shrink. Insurance companies, most of the time, will not cover this procedure since it is considered a cosmetic issue; however, the initial consultation may be since it will be billed as if it were a regular doctor’s visit. If insurance were to cover it, the endovenous laser treatment and sclerotherapy will be the most popular treatments covered. If your insurance plan isn’t going to cover the procedure, then ask your doctor if you can set up some sort of payment plan. Even if they don’t have this option, then you may be eligible for a third-party loan service. Groupon often offers discounts for local clinics that specialize with this type of treatment. Before buying a discounted coupon, however, always make sure you read the reviews before purchasing.